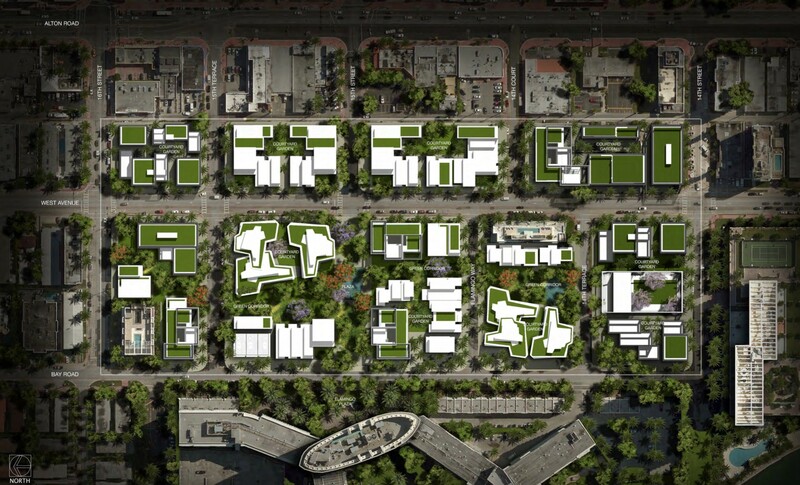 Just four months after going public with his proposal for a comprehensive vision for 15.5 acres in Miami Beach’s West Avenue area, developer Todd Glaser has withdrawn the plans from consideration. Glaser wanted to build a resilient residential area with small cafés, retail stores, and art galleries, “a city of the future” dubbed WoW for West of West Avenue, but he pulled the plug for the time being after a less than enthusiastic response from City staff. At this month’s Land Use and Development Committee meeting, Commissioner Ricky Arriola, who had been working with the developer to explore the concept, said Glaser decided not to proceed. “Our biggest concern with the initial development proposal was twofold,” he said. “One we thought that the proposal to unify all these different blocks, particularly with the second level spine, was very intriguing. We liked the bold vision. We thought that as drafted initially that there was too much of a loss of landscaping. We had concerns with how the first level was being treated but our biggest concern was since it involved right of way vacations and a development agreement, we thought that all three should travel together.” The proposal was in the concept phase and not at the point of a formal agreement. “Our concern with the introduction of commercial uses was twofold,” he continued. “One, there was an active commercial corridor a block away [on Alton Road] but, two, we also had a concern with commercial uses as a main permitted use because as a main permitted use, basically all the buildings could become commercial, so in our revised memo, we suggested that as this moves forward the developer take another look at how the landscaping might evolve, how the setbacks could evolve and how the particular overlay might develop on a block by block basis in the event that it can’t move forward in a comprehensive way because of ownership.” Glaser owns several properties in the area but a small percentage of the total number. The area included spans West Avenue to Bay Road between 14th and 16th Streets. “The other thing we suggested was, perhaps, rather than looking at commercial as a main permitted use, perhaps it becomes an accessory use to residential and that might be something that would be less impactful,” he said. After Mooney’s explanation, Arriola said, “The developer who brought this forward is withdrawing this item but I wanted to have a discussion amongst us and with you,” he said to Mooney. “I had heard that there’s a concern from staff that politically this isn’t going to fly and we’re not going to recommend it. Leave the politics to us,” he said. “The other thing is, with respect to the commercial mixed-use, we do this all over the city. That should not be, as a policy matter, a reason to kill a project,” Arriola added. “Unless the developer wants to bring this back, it’s dead,” Arriola said. “But there is community support for this, for a lot of reasons, some of it being economic. Some folks are homeowners there who feel like they’re kind of trapped because nobody’s going to buy their property given where it’s at now from a flooding perspective." RE:MiamiBeach spoke with Glaser about the withdrawal. He, too, thought the development could be a global example of a coastal city that combined commercial and residential uses in a way that is highly resilient. In his vision, WoW is a residential area where people just go downstairs to have coffee or to shop. “They don’t have to trek across town. This town is going to be gridlocked like Japan,” he said. Glaser called the 15.5 acre area he targeted “probably the most valuable real estate in the U.S. that’s underdeveloped.” He heard there was some move to designate the area historic, noting at the same time some residents of the Palm View area which is also vulnerable to flooding are looking to reduce restrictions placed on their homes by its historic designation. “It’s a disaster,” he said. “I’m pulling out indefinitely. The block by block proposal isn’t feasible, Glaser said while asking why he and his investment partners would spend millions of dollars to risk having the City say “no” to any future proposed plans. “It is it what it is,” he said. At this point, he’s renting out his properties. In December, he told RE:MiamiBeach that he and several other investors including brothers Sean Posner and Jarrett Posner, Charles Ratner, and Fred Carlton, had purchased a total of six properties. In the meantime, he said, “Let’s see if the sentiment changes from the people who live in the area when they slowly but surely realize the developer that was going to buy everything and pay market price” is now out of the mix. “The most important thing is we need to get the public in this area behind it and sending emails to the Commission and the City Manager," he said "This the dream of a lifetime" that could become "a missed opportunity." Background materials and the City staff memo on the project can be found here. If you’d like to send comments to Commissioners, addresses can be found here.